Joint sparse representation is not ideal for the processing of outliers in image, so a weighted joint sparse representation model for image denoising is proposed. This model introduces a weighted matrix of common information shared by data samples and reduces the influence of outliers. The greedy algorithm based on weighted simultaneous orthogonal matching pursuit is used to approximate the global optimal solution of the model effectively. The weighted noisy image block is used to remove the mixed noise of the image by jointly coding the nonlocal similar image blocks. By combining global priori knowledge and sparse errors into one unified framework, the denoising performance is further improved. Experimental results show that the denoising performance of this method is better than the existing hybrid denoising methods. Y. Hu, “A Mixed Denoising Algorithm Based on Weighted Joint Sparse Representation,” J. Adv. Comput. Intell. Intell. Inform., Vol.23, No.2, pp. 313-316, 2019. J. Li, K. Xie, and N. Ruan, “Medical image enhancement based on curvelet transform,” Computer Engineering and Design, Vol.38, No.1, pp. 187-191, 2017. E. C. Tetila, B. B. Machado, N. A. de Souza Belete et al., “Identification of Soybean Foliar Diseases Using Unmanned Aerial Vehicle Images,” IEEE Geoscience and Remote Sensing Letters, Vol.14, No.12, pp. 2190-2194, 2017. Z. Liu, “Research on License Plate Recognition Technology Based on Improved Adaptive Image Segmentation Algorithm,” J. of Southwest China Normal University (Natural Science Edition), Vol.42, No.5, pp. 28-33, 2017. G. Ghimpeeanu, T. Batard, M. Bertalmo et al., “A decomposition framework for image denoisingalgorithms,” IEEE Trans. on Image Processing, Vol.25, No.1 pp. 388-399, 2016. T. Huang, W. Dong, X. Xie et al., “Mixed Noise Removal via Laplacian Scale Mixture Modeling and Nonlocal Low-Rank Approximation,” IEEE Trans. on Image Processing, Vol.26, No.7 pp. 3171-3186, 2017. S. Ling, R. Yan, X. Li et al., “From Heuristic Optimization to Dictionary Learning: A Review and Comprehensive Comparison of Image Denoising Algorithms,” IEEE Trans. on Cybernetics, Vol.44, No.7, pp. 1001-1013, 2017. H. Bhujle and S. Chaudhuri, “Novel Speed-Up Strategies for Non-Local Means Denoising With Patch and Edge Patch Based Dictionaries,” IEEE Trans. on Image Processing, Vol.23, No.1, pp. 356-365, 2014. X. Wang, G. Chen, and G. Luo, “A logarithm-based image denoising method for a mixture of Gaussian white noise and signal dependent noise,” J. of Intelligent Fuzzy Systems, Vol.33, No.1, pp. 281-291, 2017. F. Utaminingrum, K. Uchimura, and K. Gou, “Speedy filters for removing impulse noise based on an adaptive window observation,” Int. J. of Electronics and Communications, Vol.69, No.1, pp. 95-100, 2015. P. Zhang and F. Li, “A new adaptive weighted mean filter for removing salt-and-pepper noise,” IEEE Signal Processing Letters, Vol.21, No.10, pp. 1280-1283, 2014. P. Chen, M. Lin, and Y. Liang, “Wire Suspended Robot Monitoring Image Denoising Algorithm Based on Encoding with Sparse Representation,” Computer Engineering, Vol.43, No.3, pp. 261-265, 2017. J. Liu, X. C. Tai, H. Huang et al., “A weighted dictionary learning model for denoising images corrupted by mixed noise,” IEEE Trans. on Image Processing, Vol.22, No.3, pp. 1108-1120, 2013. D. Liang, Z. Liang, and W. Bao, “Image denoising algorithm based on non-local regularized sparse representation,” Systems Engineering and Electronics, Vol.35, No.5, pp. 1104-1109, 2013. J. Sulam, B. Ophir, and M. Elad, “Image denoising through multi-scale learnt dictionaries,” IEEE Int. Conf. on Image Processing. Paris, France, IEEE, pp. 808-812, 2015. 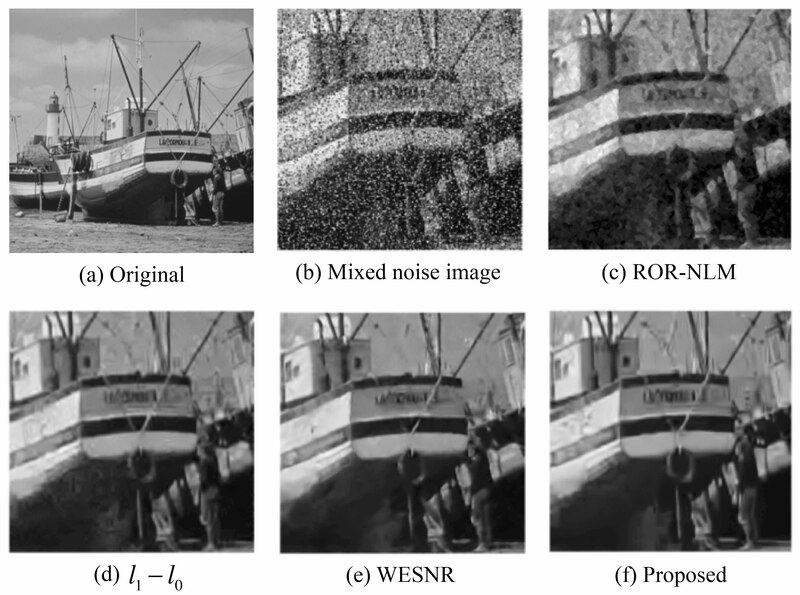 I. Djurovi, “BM3D filter in salt-and-pepper noise removal,” Eurasip J. on Image & Video Processing, Vol.2016, No.1, pp 13, 2016. M. Nandhini and T. Nalini, “A Denoising Framework with a ROR Mechanism Using FCM Clustering Algorithm and NLM,” Int. J. of Computer Science and Information Technologies, Vol.5, Issue 3, pp. 2819-2823, 2014.